Normandy is a region located in northwestern France. It is renowned through its long standing historical legacy, as from late Antiquity to the early Middle Ages it had gradually been inhabited by Celts, Romans, and Germanic tribes. The Roman empire was ultimately forced to withdraw from most of Normandy by the beginning of the 5th century as of the cause of the raids of Saxon pirates along the coastline. In the late 5th century, the area between the rivers Somme and Loire was under the rulership of Frankish lord Clovis. However, the region takes its name from the Norse settlement in the 9th century. The denomination of Normandy stems from the Old French word ‘normanz’, meaning ‘northman’. Initially, small convoys of Vikings from Scandinavia used the river Seine only to attack Paris and some local monasteries (including the one at Jumièges). Afterwards, they came bolder and in far larger numbers to seize control of northern modern day France, taking advantage of the disintegrations within Charlemagne’s Frankish Empire. The Duchy of Normandy was formed under the rule of a Norse chieftain by the name Hrolf Ragnvaldsson (known in Old Norse as Göngu Hrólfr and in Latin sources as Rollo, subsequently baptised as Robert) who had conquered Rouen (876), and sieged Paris (885-86) as well as Bayeux and Évreux, from 885 to 887. He had most likely ruled over an earldom which corresponds to the territorial extent of modern day county Møre og Romsdal, western Norway, before finally becoming Count of Rouen. There has also been quite a dispute among scholars regarding his ethnicity, with Danish historians claiming that he was Danish while Norwegian scholars claiming that he was Norwegian. Lands between Somme and Loire were ceded in the late 9th century by Charles III the Simple, the then King of Western Francia, to Rollo through the Treaty of Saint-Clair-sur-Epte in order to stop raiding the region and protect the kingdom against subsequent incursions of other Viking war bands. Charles III the Simple also demanded the conversion of Christianity of Rollo and of his men (mainly Norwegian and Danish Vikings, with a few Swedish Vikings as well). The descendants of the Norse settlers intermarried with the local population, resulting thus an ethnic mixture of Scandinavians, Franks, Celts and Saxons that together formed the Normans who will eventually conquer England in 1066 at Hastings. 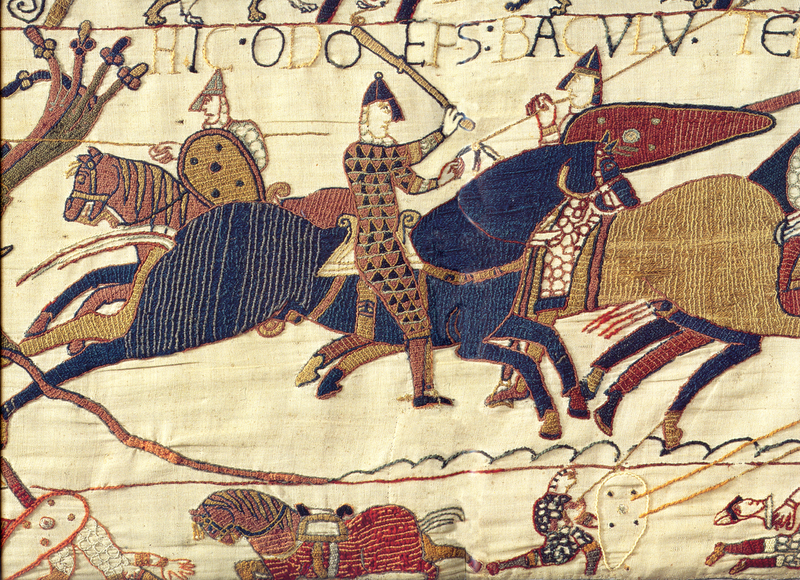 The Norman’s did not have the boats to transport their army from Normandy to England. The Norwegian fleet that initially raided York merged together with the Norman’s as initially planned. My mother, who was from More og Romsdal told me that Göngu Hrólfr, or “Gange-Rolf” meant “Walking Ralph”, which he was nicknamed because if mounted on a horse, his feet met the ground, and therefore; he was too big to ride a horse.